Bì is dry, shredded pork skin. I don’t recall exactly what the menu board at Thanh Huong said, but I am certain it did not include skin. I believe “Roast Pork” was the title. What I found when I sat down to eat my sandwich was not what I was expecting, but what would the world of sandwiches be without surprises? This was my first encounter with bì, but I was excited to try it. Sadly, my excitement was short lived. I found it to be too dry and too salty, and though I understand those are something like features when it comes to bì, this just seemed excessive. That might be my palate; I’ve come to love flavors from all over the world, but I was raised on distinctly American fare. The texture was interesting, and not in an objectionable way. It’s meat floss, and it has a wispy, fine texture worthy of that name. What seems like innumerable strands come together for a dense, very chewy bite. It’s a product that shows up in a number of Asian cuisines, and I would certainly give it another shot. I’d like to try it outside of a sandwich just so I can get a better sense of how things line up. That’s something I think we take for granted when evaluating the sandwich as a whole. We are generally familiar with our ingredients, and knowing what they taste like independently gives us a better sense of how they relate to each other. Operating in unfamiliar territory, that sense can fade quickly. So perhaps the failure here is mine, perhaps it’s the sandwich maker’s. In the end, the only thing of which I can be certain is what was right there in front of me, and that was a disappointing sandwich. 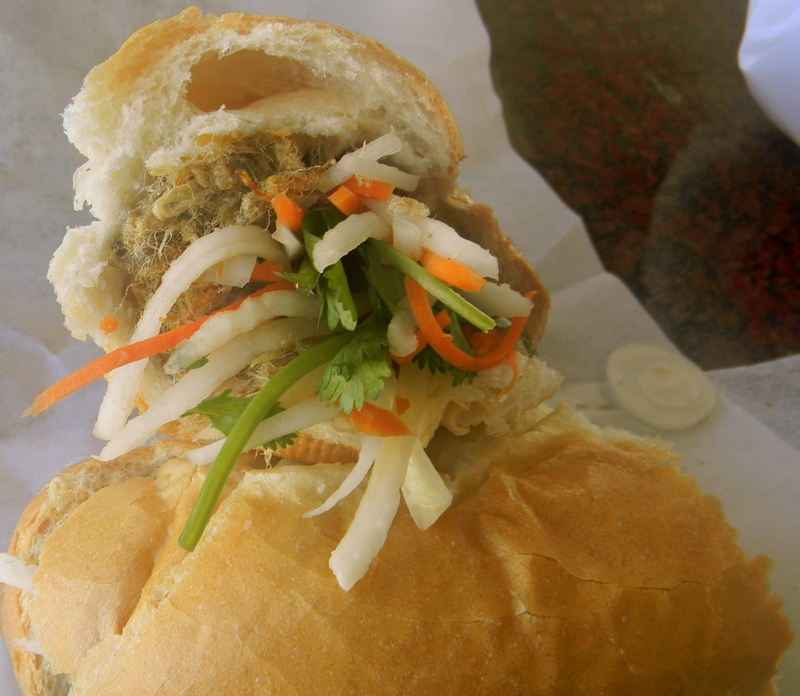 This entry was posted in A Month of Bánh Mì, Sandwich Reviews and tagged Banh Mi, Pork, Reviews by Pete, San Jose, Sandwiches I Have Eaten by Pete. Bookmark the permalink.